Aflatoxins, an important mycotoxin group, represent a major food safety concern, especially in developing countries, due to their high toxicity and widespread presence in many agricultural commodities including maize, groundnuts, sorghum, wheat, millet, coffee beans, cassava, spices, soybean, sunflower, cottonseed, meat, milk and eggs. Aflatoxins are produced by certain fungi, mainly Aspergillus flavus and Aspergillus parasiticus. There are four naturally produced aflatoxins including B1, B2, G1 and G2. Aflatoxins M1 and M2 are the hydroxylated metabolites of aflatoxins B1 and B2; they are produced when mammals consume aflatoxin-contaminated commodities and are found in products such as meat and milk. Aflatoxin contamination can occur at any stage of the food supply chain, especially during production (pre-harvest) and storage (post-harvest). About 25 percent of the world’s agricultural commodities are affected by aflatoxin and other mycotoxins, with more than one billion tons of food loss every year. Consuming aflatoxin-contaminated commodities causes acute (caused by short-term exposure to high levels; the acute lethal dose, for adults, is approximately 10-20 mg of aflatoxins) or chronic (caused by long-term exposure to low or moderate aflatoxin levels) aflatoxicosis, which may lead to immune suppression, liver cancer and stunting in children. Billions of people in developing countries are at risk of chronic aflatoxicosis. The severity of aflatoxicosis is much higher in developing countries than developed countries because of the higher prevalence of the hepatitis B virus in developing countries. Individuals who are both exposed to aflatoxins and infected with the hepatitis B virus have 30 times the risk of getting liver cancer than the ones who test negative for the hepatitis B virus. Aflatoxicosis contributes to about five to 30 percent of liver cancer cases globally. Also, stunted or underweight children have an average of 30-40 percent higher levels of aflatoxin than children with a normal body weight. According to World Health Organization (WHO) estimates in 2015, aflatoxins cause 22,000 illnesses and 20,000 deaths worldwide. 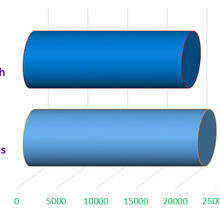 Graph: Annual Number of Illnesses and Death Caused by Aflatoxins. Thus, governments must develop and enforce standards and regulations to successfully reduce the aflatoxiosis outbreaks. There are many food safety practices and physical, chemical and biological measures that the food industry (producers and processors) can apply to reduce and eventually eliminate aflatoxins contamination during pre- and post-harvest, including good agricultural practices (GAPs), plant breeding, pesticides (fungicides), good manufacturing practices (GMPs), hazard analysis and critical control point (HACCP), cleaning, adsorbents, heating, microwave, cold plasma, irradiation, ozone, hydrogen peroxide, ammonia, acids, bisulfites, microorganisms, and enzymes. Consumers can also play an important role of reducing the negative impact of aflatoxicosis by changing their diets to avoid high-risk foods such as maize. Aflatoxicosis outbreaks have been reported in several developing countries including Kenya, India, Thailand, Malaysia and Tanzania. Aflatoxin-contaminated maize is, particularly, a global concern because maize is a widely cultivated staple commodity worldwide. It is also one of the main diet components in many developing countries. For example, more than 40 percent of rural and urban diets consist of maize or maize products in Kenya. Several aflatoxicosis outbreaks associated with the consumption of aflatoxin-contaminated maize were reported in Kenya between 1978 and 2008, with the largest outbreak occurring in 2004 resulting in 317 illnesses and 125 deaths. Immediately after this outbreak, the Kenyan government invited the Centers for Disease Control and Prevention (CDC) and the WHO to participate in the investigation. The team collected maize and maize product samples from households and markets. Out of the 31 samples collected from households, 15 samples had between 20 to 8,000 ppb aflatoxin B1 (the aflatoxin limit in Kenya at that time was 20 ppb). Of the 342 samples collected from markets, 182 had more than 20 ppb and some samples had more than 1,000 ppb aflatoxin. The investigation concluded that maize from households, harvested during the high-risk season between April and June, was the source of this outbreak. Accordingly, the Kenyan government advised the residents of affected districts to avoid consumption of maize or maize products. In addition, suspected commodities were destroyed and replaced with safe commodities. Furthermore, the government of Kenya, in collaboration with the CDC and WHO, initiated a public health response to conduct clinical disease surveillance for acute aflatoxicosis and educational programs to educate farmers about the sources of aflatoxin contamination and proper drying and storing practices. Furthermore, the Partnership for Aflatoxin Control in Africa (PACA) was established to serve the African countries. In 2011, the U.S. government through Feed the Future provided $12 million to support the PACA. Also, the government of Kenya reduced its regulatory limit from 20 to 10 ppb. 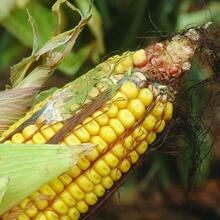 Failure to meet international aflatoxin standards costs African countries about $750 million annually. In developed countries, such as the United States, enforcement of aflatoxin standards and pre- and post-harvest control measures have largely eliminated the exposure of consumers to aflatoxin-contaminated commodities; however, aflatoxin still costs the U. S. hundreds of million dollars annually. How can the government of Kenya prevent household-level aflatoxicosis outbreaks associated with maize in the future? What is being done to reduce illnesses through street food, given that it is a cheap option for food for poor urban workers?